Many homes have a long, narrow kitchen space. And designing a kitchen that makes use of this space can be a challenge. Many of the best kitchen design features are generally reserved for larger kitchen spaces, and in a narrow kitchen, you probably wont be using a kitchen island. But this doesnt mean your kitchen space cant be stylish, attractive and practical. 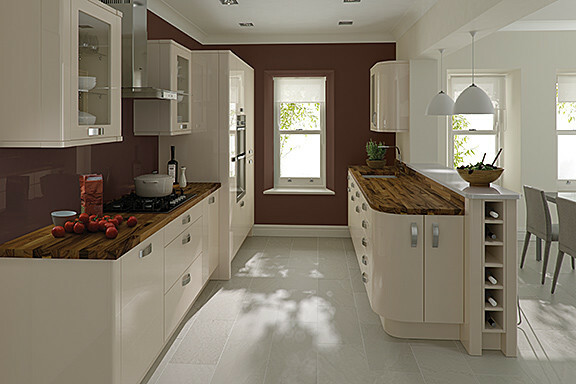 Here at Homematas, we are Preston’s leading kitchen design professionals. And we work day in, day out, to help local homeowners and property developers make the right choice for their kitchen. As a result, we have produced this guide to making the most out of a narrow kitchen space. An L-Shaped layout- with cabinets lining two connected walls, sharing a corner, the L shaped layout can be beneficial for narrow kitchens. The additional cabinet at the end, to form the L will provide additional storage space than just a single galley kitchen, and it can be a good place to position to the oven or even the sink. A single galley- a single galley kitchen is simply a kitchen with only one row of cabinets and workspaces. This takes up the least room in a long, narrow kitchen, and can be a good use of space. A double galley- if your kitchen is slightly wider, a double galley kitchen could be a good option. This is a kitchen layout option that positions cabinets and work-spaces down both sides of the kitchen, doubling the storage and workspace of the single galley kitchen. For more information or advice about designing your galley kitchen, get in touch with the experts today, here at Homematas.